It’s an idea echoed everywhere from “Friends” to “Girls”: Young people want to live in cities. And, we’re told, a lot of them (at least the cool ones) do. It’s a common assumption. But it’s also wrong. Between 2010 and 2013, the number of 20- to 29-year-olds in America grew by 4 percent. But the number living in the nation’s core cities grew 3.2 percent. In other words, the share of 20-somethings living in urban areas actually declined slightly. This trend has occurred in supposedly hot cities like San Fransisco, Boston, New York and D.C., notes demographer Wendell Cox. Chicago and Portland, Ore., both widely hailed as youth boom-towns, saw their numbers of 20-somethings decline, too. To some extent, this is an economic problem. Millennials can’t always afford the most popular cities, which have gotten increasingly expensive and unequal. It doesn’t help that most young people, even with college degrees, are experiencing steadily dropping annual earnings. And their careers are progressing more slowly too. But it’s not just that. According to the most recent generational survey research done by Magid and Associates, 43 percent of millennials describe the suburbs as their “ideal place to live,” compared to 31 percent of older generations. Only 17 percent of Millennials identify the urban core as where they want to settle permanently. Another survey, by the Demand Institute (funded by the Conference Board and Neilsen), found that 48 percent of 20-somethings hoped to move to the suburbs one day. And contrary to popular myth, they hoped to own a single-family home. Sixty-one percent seek more space. These findings may actually understate the suburban preference. As people age, particularly entering the child-bearing period between 30 and 50, they long have displayed a distinct tendency to move to suburban areas. A lot of the amenities that once drew people to gritty cities are popping up in the suburbs instead. The New York Times documents a trend of people moving from Manhattan and Brooklyn to the verdant suburbs of the Hudson Valley. Increasingly, those towns boast art house films, vegan restaurants and other hip accoutrements. Incipient hipster suburbs can also be found in places like Montclair, N.J., Claremont, Calif., and even Irvine, whose Millennial population last decade grew more than four times as much as that of downtown Los Angeles. Once a foodie desert, Irvine and its surrounds now boast dim-sum houses, Vietnamese, Korean, sushi and California cuisine restaurants. That’s thanks to another trend: Immigrants are bypassing cities and moving to the suburbs in droves, according to Brookings. And they’re bringing good, cheap ethnic food along with them. Nowhere are these changes more marked than among Asians, now the nation’s largest source of new immigrants. For example, in the New York metropolitan area, the Asian population grew both in numbers and in percentage far more rapidly in the suburbs than in the core city in the past decade. Nationwide, the Asian population in suburbs jumped by almost 2.8 million, or 53 percent, while that in core cities grew 28 percent. A great American ethnic culinary tour today would take you not to Manhattan, San Francisco, Hollywood or Chicago, but to places like the San Gabriel Valley, roughly 10 miles east of downtown Los Angeles. This highly suburban region of strip malls and giant food palaces arguably boasts the largest, and most diverse, collection of Asian restaurants in the nation. A CNN survey of America’s top 50 Asian restaurants located seven in the area, the most of any region. That includes foodie havens like New York City. Three others were in the heavily Asian suburbs of Silicon Valley. As Tyler Cowen noted, the best places to find distinctive ethnic cuisine in Greater Washington is not in the urban core but in far-flung suburban strip malls, where rents are cheap, parking is adequate and there’s a built-in community of eaters craving home. Much the same can be said for Asian markets, temples or schools. Sugarland, some 22 miles further west of downtown Houston, is home to one of the nation’s largest Hindu temples. The largest Hindu temple in the world is now under construction in Robbinsville, N.J. — an exurb of New York some 60 miles south of Manhattan. Indeed, in large parts of America, many successful malls are those that are getting “ethnicized.” A prime example is La Gran Plaza on the outskirts of Fort Worth, Tex., where a once-failing mall is now booming, converted to look like an old village in Northern Mexico, with loads of restaurants, markets, wedding and quincenara shops and a huge swap-meet. This is in addition to live music and, on some Sundays, Catholic Mass. As their demographics change, so too do the functions of suburbs. No longer mere bedroom communities, they are becoming economic centers of their own. Despite the constant hype about the new appeal of downtown locations, jobs continue to follow the migration of middle-class families. Having been widely written off for dead, suburban office space also began to recover last year at a much quicker rate than in city centers, according to the office consultancy Costar. Overall, suburbs already account for close to three quarters of the nation’s office inventory. Suburbia is not the city’s antithesis, but its natural extension, particularly as young people morph towards adulthood. Rather than vilify suburbs as fundamentally inefficient, deadening and wasteful, its time to focus on how to improve the preferred environment for work, interaction and raising the next generation for most Americans. Cities have changed too, of course, in many cases for the better. But the suburbs are evolving as well. And all indications suggest that they are likely to retain their preeminence as Americans’ preferred places to settle down. Submitted by Motion_man1 on Thu, 10/16/2014 - 15:36. There are large swaths of land called rural in this country that are extremely affordable and sometimes even within reasonable commutes of great millennial employment opportunities in small and large cities. You seemed to forget about them and the fact that they serve many goals of young hip people, including finding affordable housing, becoming more self-sustainable, owning land instead of a side yard, and finding community, culture, and great culinary traditions outside of human density. Submitted by Tom Lane on Thu, 10/09/2014 - 03:24. Contiguous suburbs with affordable housing, adjacent to the central city, are increasingly hard to find in California, Oregon, and Washington. For example, almost all of the San Francisco area is expensive, due to UGB's, and the region's Superstar Status (Dr. Joe Gyourko). Therefore, refugees for singles and young couples starting families are 50 to 100 miles away from the central city. For example, Chico is a very popular place for singles and young families, well north of Sacramento. And, land use restrictions in Orange, L.A., and Riverside Counties cause migration to the Coachella Valley, where singles and families move to a variety of cities, especially the less expensive Palm Springs, Cathedral City, and Palm Desert. Reno is another city that people escape to for affordable housing, but it's not a contiguous suburb, either. Reno Mayor Bob Cashell views Reno as part of a giant metropolis extending 220 miles from Reno to San Francisco. Of course, the California side of this line is full of sequential UGB's and other restrictions. Placer County has placed everything east of Bell Road in Auburn as "large lot zoning." And, in this case, the lots are so large that subdivisions cannot be established, with the typical "country estate" home on 5 acres going for $700,000. The Sacramento area land use restrictions have helped Cashell's legacy. He is retiring as mayor, this fall (2014). In the past 12 years, Cashell presided over Reno's best years, when the city quickly emerged into a medium sized market with thriving residential suburbs and several new shopping centers. Just a few days ago, Cashell's legacy was enhanced by the announcement of the new Tesla car battery plant in Reno, bringing 6000 jobs to the region, and 32000 newcomers over the next 20 years. The coast does not provide affordable housing. San Luis Obispo is a delightful college town with many cultural and food amenities, but a strict UGB results in apartments of $1200+. Although Ventura County is actually adjacent to Los Angeles, it is very expensive due to the legacy of Maria VanderKolk and many others. Rents go down in the artistic hippie town of Ojai, but not by much. However, the conservation efforts of VanderKolk and others in Ventura County are admirable. Thousand Oaks is 20% open space, and we all need open space. Unfortunately, Ventura County anti-growth regulations are superseded in intensity by the much stronger anti-growth forces further up the coast in Santa Barbara, the Santa Ynez Valley, and the aforementioned San Luis Obispo. San Luis Obispo and Santa Barbara Counties are expensive, and less than 1% developed, due to anti-growth forces stronger than anything in Ventura County. 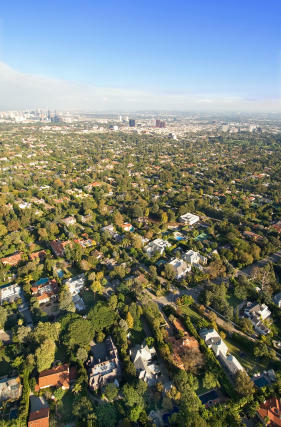 The California coast is not like many areas of the east coast or gulf of Mexico, that have greater amounts of suburbanization. Although the LA Coastal Plain is the most heavily populated coastal plain in the US, there is still plenty of room for more affordable housing northward on the coast all the way to Pacifica. Ronald Reagan did not like the amount of federally owned land on the coast. He wanted every Californian to have beachfront property. I agree, although like Thousand Oaks, I propose leaving 20% as open space (as public parks on the coast). That's a good balance - Dallas is 17% open space. Also, auction off the Owens Valley from Bishop to Ridgecrest. That would solve the affordable housing problem, and singles and young couples stuck in Los Angeles could finally leave to own bargain priced land. Ronald Reagan and Frank Lloyd Wright, who also advocated decentralization, must think alike. Submitted by TD on Thu, 10/09/2014 - 11:38. Left out of your discussion is that young families, who are priced out of many of CA's urban areas, are substantially minority. In fact, young and minority are almost synonymous terms these days. Existing homeowners in these "protected" areas are often older and white, and they are seeing their home values increase rapidly. Now, this is liberal CA. No one would be so crass as to say that a young minority who scores big in a tech IPO should be prevented from buying where they want. However, they can make sure that it is only those who do score big who can buy in their neighborhood, ensuring that they probably won't have too many minority neighbors for the remainder of their lives. Submitted by Tom Lane on Fri, 10/10/2014 - 06:16. It is increasingly difficult for minorities to find housing in the Inland Empire. Also, the gay population, many of whom are single, can no longer afford the coast, and move to inland areas and Las Vegas. Current housing policies in California do not favor home ownership for minorities and gays.